with 13 beautiful traditional floats. The festival was designated as National Important Intangible Folk cultural assets. 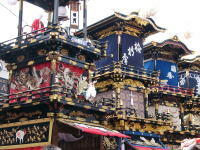 Each float has karakuri (mechanical pupetts) on the top. 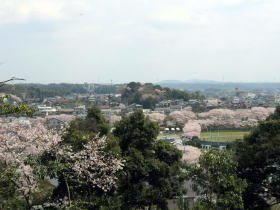 which sits at the foot of the hill of Inuyama Castle. From 7:00p.m. to 10:00p.m. each float tour around each area. One of the highlights of this festival is Donden /Shagiri. they show us special technic and power. 9:40〜10:40 Thirteen floats gather in front of Haritsuna Shrine one by one. Stay there until noon. 12:00-13:15 The crew of the six floats (station gathering group) dedicate karakuri performance to the God of Haritsuna shrine. 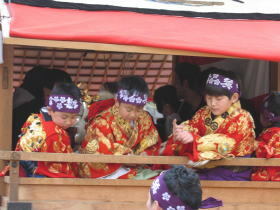 13:40-15:10 The crew of the seven floats (shrine gathering group)　perform karakuri to the God of Haritsuna shrine. 19:30-19:55 Six floats of the station-gathering-group　return to their bases one by one. 18:45-19:15 Seven floats of the shrine-gathering-group return to their bases one by one. 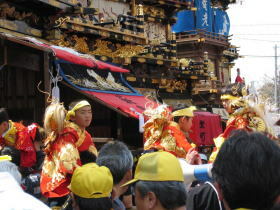 10:00-14:40 The crew of the 6 floats dedicate karakuri performance to the God of Haritsuna shrine. Then 6 floats (Group North) move to Yosaka, and 7 floats (Group South) to Inuyama-guchi. 18:30 Each float turns on the 365 lights. 18:40-19:10 7 floats (Group South) start to return to their blocks one by one. 20:20-20:45 6 floats of the Group　North start to return to their blocks one by one. Get off at Inuyama Sta. on the Meitetsu Line. Get off at Inuyama-Yuen sta. on the Meitetsu line. 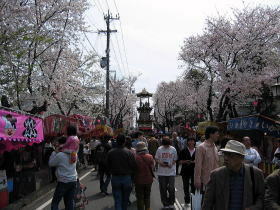 Head to the Inuyama Castle or follow the crowd.